Fr. 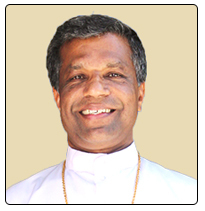 Kalluvelil was born November 15, 1955 at Thottuva near Kuravilangad, a parish in Palai diocese, Kerala. Now his family is settled in Jellipara, in Palghat diocese. After his initial seminary formation at St. Mary’s Minor Seminary, Trichur, he did his philosophical and theological studies at St. Thomas Apostolic Seminary, Vadavathoor, Kottayam. He was ordained a priest on December 18, 1984 for Palghat diocese. After his ordination he served at Agali, Kuruvampadi, Puliyara, Panthalampadam, Olavakode, Doni, Ottapalam, Kottayi, Kallekad, Cathedral Church, Palakad, Kodunthirapully, Kanjirapuzha, and Mezhukumupara parishes and Boys Homes at Agali and Thavalam. He was also Director of the Eparchial Pastoral Centre, Catechetical Centre, besides being one of the diocesan consultors. He obtained his Doctorate in catechesis from the Salesian University, Rome. For the past two years, he was doing pastoral ministry to the Syro-Malabar faithful in Toronto. He was ordained bishop on 19th September 2015.